Assisting you through the process to Buy/Sell your home! 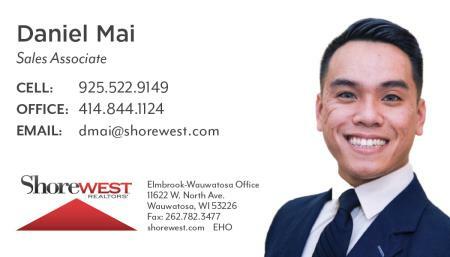 I have a deep understanding and extensive knowledge of our local Real Estate Market (Pewaukee, Eagle, Menomonee Falls, Wauwatosa, Nashotah, Oconomowoc) that helps me assist both home buyers and home sellers. My goal is to provide a smooth and effortless transition for your transaction, from initial consultation to closing escrow. I bring a diligent work ethic and an aggressive approach to buying and selling. I truly love my profession and welcome any opportunity to be of assistance to you.